Born into a West Indian family in East Flatbush, Brooklyn, New York. She received her Associates Degree in Illustration at Fashion Institute of Technology (FIT), New York in 2014. She is currently working towards earning a Bachelor Degree in Textile/Surface Design, FIT. 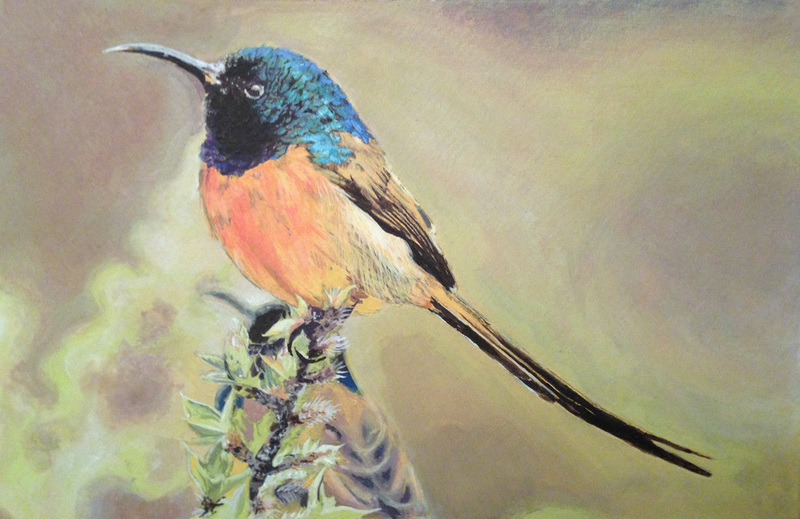 "I chose to paint the Humming Bird since it is the official bird of Trinidad and Tobago, and also to showcase my love of detail and color theory. My process for this piece was completed in three steps. First I did a detailed tracing by hand from my reference onto an illustration board. The second step was painting the entire board with layers of burnt sienna according to the variation of light, medium and dark. Then I repainted, in layers, over the burnt sienna with the colors from my reference."